Seeds, nuts, grains - healthy or not? When it comes to bird nutrition, the internet is awash with conflicting claims. It's generally agreed that an all-seed diet is unhealthy, but no one seems to agree on anything else when it comes to seeds, nuts and grains. Some will tell you that all seeds and nuts are bad, some will say that certain seeds are bad, still others will say that seeds are bad but tree nuts are good, and other variations on the theme. This article will attempt to separate the facts from the fiction. At the most basic level, seeds, nuts and grains are all the same type of thing. They are the reproductive unit of a plant which will germinate and develop into a new plant under the right conditions, and they contain nutrients and other chemical compounds to support the initial stages of this process. We have classified these "reproductive units" into different categories based on their characteristics. Grains are significantly lower in fat and significantly higher in complex carbohydrates than seeds and nuts. There isn't a dramatic difference in the nutritional composition of seeds and nuts, so the classification is based on other characteristics. Nuts are generally bigger than seeds and grow on trees, while seeds are generally smaller and grow on a different type of plant. Legumes (including peanuts) and beans also fit into the general category of "reproductive unit of a plant". But we tend to mentally classify them as being significantly different from seeds, grains and nuts, and indeed there are some significant nutritional differences. So they won't be discussed here. Nutritionally, grains, seeds and nuts have a lot in common. In general they're fairly high in protein (but don't have enough methionine, an essential amino acid), fairly high in minerals (but also contain antinutrients that can interfere with mineral absorption), have a significant energy source (fat and/or complex carbohydrates), and they're low in certain vitamins, especially A, C, and E. Like all plant foods, they also don't contain vitamins D3 or B12. Vitamin C isn't important for most birds because they can make their own, but they need to get the other "missing" vitamins from the diet (or sunlight, in the case of vitamin D). This is why an all-seed diet is unhealthy - it doesn't provide all the essential nutrients, so a diet consisting only of seeds, grains and/or nuts will lead to nutritional deficiencies. But you can say the same thing about any other natural food if it's fed as the sole diet, and if you want nutritional completeness in a single package you have to offer your bird some pellets. Grains, seeds and nuts do provide significant amounts of many essential nutrients, so it's absurd to classify any of them as an unhealthy food that pet birds should never be allowed to eat. They are very healthy and beneficial as part of a varied diet that is well-balanced overall. Vegetables tend to be low in protein and energy and high in the vitamins that are missing from seeds. So in many ways vegetables and seeds/grains/nuts complement each other, each one providing nutrients that the other one lacks. Unfortunately, balanced nutrition isn't as easy as simply serving your bird both veggies and seeds/nuts/grains. For one thing, you've got to keep an eye on the total energy that's being consumed, because obesity and atherosclerosis are huge health problems in the pet bird population. High-fat seeds and nuts are quite high in calories, so the quantity should be limited in most cases. Grains aren't as high in calories as seeds/nuts but the calorie count is still significant. Additionally, certain ratios between some nutrients are desirable to assure proper absorption. A calcium to phosphorus (Ca:P) ratio of about 2.5 to 1 is recommended for proper calcium absorption. But it appears that this ratio is most relevant during bone growth in infants and juveniles, and its relevance to adults is questionable (Dietary Reference Intakes, Australian Ministry of Health). However, it is generally accepted in the reptile-keeping community that calcium supplementation is required to prevent calcium deficiency when feeding a diet of high-phosphorus insects (LLLReptile, DrsFoster&Smith). Therefore it appears that a severe imbalance between calcium and phosphorus can be problematic, and it's wise to pay some attention to the balance of these minerals. Seeds/nuts/grains all have considerably more phosphorus than calcium so they don't meet the desired ratio. Too much phosphorus is a problem because the principal form of phosphorus in plants is phytic acid (phytate) which inhibits the absorption of other minerals including calcium, iron and zinc. Some seeds/nuts/grains skew more badly in the wrong direction than others but all of them miss the target, and additional calcium is needed from some other source in the diet to achieve the proper balance. Furthermore plant foods contain other anti-nutrients like oxalates that interfere with the absorption of minerals (especially calcium), so the amount of calcium/minerals that's listed for a particular food might be a lot more than the amount that the body can actually use. Another ratio that needs to be considered is the amount of Omega 6 fats to Omega 3 fats, with a recommended range of 3:1 to 1:1. These two fats are essential nutrients. The other two fat categories (Omega 9 and saturated) are not essential because the body can make all that it needs. The need to maintain this precise ratio is questionable, since it appears that the body uses Omega 3 preferentially when it is available (Oregon State, Stanford). But Omega 3 fats tend to be undersupplied in the diet, and all the other fat types tend to be oversupplied. Omega 3 deficiency has been linked to a wide range of "inflammatory" diseases including heart disease, cancer, and arthritis. So we need to focus on getting more Omega 3 fat into the diet while keeping the overall fat consumption to a healthy level. Unfortunately most seeds/nuts/grains contain mostly Omega 6 fats and very little Omega 3. But there are a few seeds with a lot of Omega 3, including flax, chia, perilla and kiwi fruit seed. Hemp seed has a 3:1 ratio which is considered to be the perfect balance. But the seeds with higher Omega 3 are really more desirable, since we need to make up for the shortage of Omega 3 in the rest of the diet. Now that we've explained all that, click on the image at left for a chart showing nutritional profiles for grains, seeds, and nuts that are commonly fed to birds, with a couple of vegetables thrown in for contrast. If it looks a bit blurred on the screen, zoom in a little; it displays best at full size. Millet, canary grass seed, oats, corn and wheat represent the grain category; the oil seeds are flax, hemp, safflower, and sunflower; the nuts are almonds, brazil nuts, coconut, and walnuts; and the vegetables are carrots and kale. All figures are for 100 grams of raw food with the shells removed (if applicable), unless indicated otherwise. Dried corn and dried coconut were used because the high water content in the fresh version would skew the comparability with the other foods. There aren't many surprises here. The grains are generally lower in fat and calories than the seeds and nuts, and the seeds and nuts aren't very different from each other. Any given food on the list is higher in certain nutrients and lower in others than any other food on the list, so in most cases you can't really say that one is significantly better than another; one is just better at meeting a specific need than others. Be aware that the protein percent shown in the chart is the total amino acids not the amount of complete protein, so the protein percentage is somewhat misleading - certain amino acids will need to be supplied from other sources to get enough complete protein. The chart indicates that coconut (which is often hyped as a miracle food) is generally lower in nutrients than the other nuts, and corn (which is often maligned as an inferior food) equals or surpasses it in some ways, at about half the calories. Almonds are sometimes praised as a good source of calcium, but the chart shows that they're really kind of iffy. Their Ca:P ratio of 1:2 doesn't fail to meet the ideal of 2.5 to 1 as badly as the other items on the list, but it does fail. Walnuts are sometimes praised as a good source of Omega 3 fats, and at a 4:1 ratio they're not too far removed from the ideal of 1:1 to 3:1. But hemp is a better source, and flax beats both of them by a huge margin. It is sometimes said that safflower is preferable to sunflower because it is lower in calories. Sure enough, Table 1 in the previous section shows that 100 grams of sunflower has 584 calories while 100 grams of safflower has only 517 - a substantial difference. But although safflower really does have a lot fewer calories, you need to consider how much nutritional value that you get with those calories. 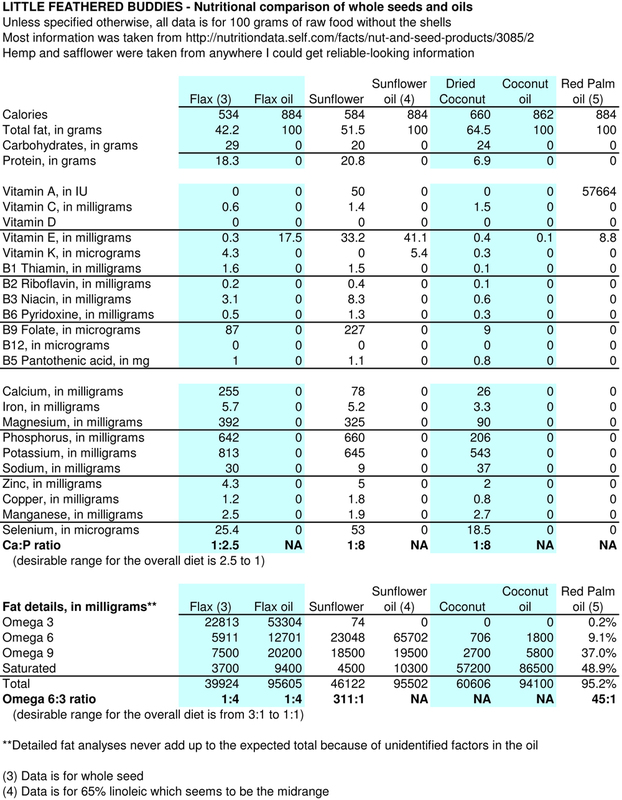 100 grams of sunflower provides 166% of the human requirement for Vitamin E; the amount of Vitamin E in safflower apparently hasn't been published, but it's generally agreed that sunflower oil has more E than safflower oil does. Sunflower has more B vitamins too. They both have the same amount of riboflavin (B2) and safflower has more panthothenic acid (B5), but sunflower has more of everything else. Sometimes a LOT more; sunflower has seven times as much niacin (B3) as safflower. But the biggest reason why I prefer sunflower over safflower is its superior protein content. Sunflower has more protein (21 grams versus the 16 grams in safflower), and the quality of the protein is much higher. Nutrition gives sunflower a protein quality score of 88, and a score of 65 to safflower. Both fall short of the ideal of 100 or higher, but you're getting a lot more bang for your buck in the protein department with sunflower. 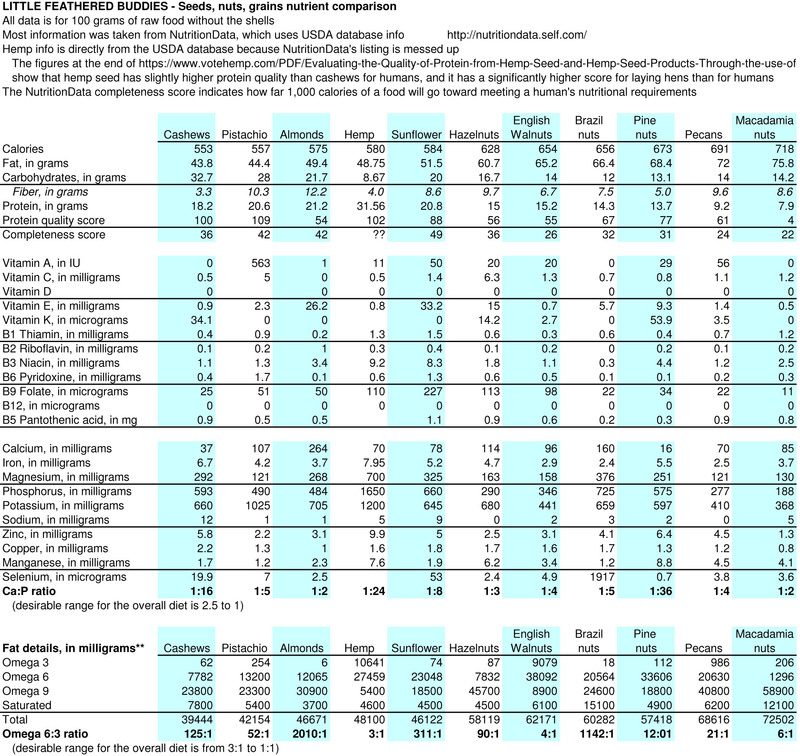 The NutritionData listings for sunflower and safflower have the amino acid details. Be sure to change the serving sizes to 100 grams for comparison purposes. These listings also show NutritionData's nutrient balance rating, which indicates how far 1,000 calories of the food will go toward meeting a human's daily nutrient requirements. Sunflower has a rating of 49 while safflower is much lower at 38. Sunflower is so nutritious that the human alternative community calls it a superfood; it's only the bird community that says bad things about it. I don't believe in superfoods (the word is basically a "beware of hype" warning), but there's no doubt that sunflower has a lot of nutritional value. Don't forget that both of these seeds have quite a lot of fat in them and need to be fed in moderation. But they're significantly lower in fat than most tree nuts, as discussed in the next section. Lately there has been a lot of talk in bird circles about the amazing nutritional benefits of tree nuts, especially the "healthy" fats in them. This is frequently done without mentioning that the fat content in these nuts is very high and can lead to obesity issues if too many of them are fed. Many of the same sources that speak reverently of tree nuts will simultaneously disparage sunflower seed as junk food. So I created Table 2 at left to see how the best of the oil seeds (hemp and sunflower) compare nutritionally to tree nuts. The quick summary of the results is that overall, hemp seed is clearly superior to everything else on the list, and there's room to argue about whether pistachio nuts or sunflower seed is second best. NutritionData votes for sunflower, but I think it's difficult to choose between them. All the other tree nuts clearly deliver less nutrients per calorie overall, although there are some that excel for one particular nutrient. The listings in Table 2 are arranged according to their calorie content, from lowest to highest. Notice how the percentage of fat steadily increases as the calorie count goes up. This is not a coincidence. Meanwhile the protein and carbohydrates fluctuate somewhat randomly as you scan across the columns; their percentages are related more to each other than to the fat content. Also notice how the completeness scores (which measure how far 1,000 calories of the food will go toward meeting the nutritional requirements of humans) are higher on the lower-calorie end of the scale than on the higher-calorie end. Although there are plenty of fluctuations for individual nutrients, the total vitamin and mineral content tends to be fairly similar for everything on the list. Under these conditions, the amount of micronutrients per calorie will obviously go down as the number of calories goes up. The foods on the lower-calorie side of the chart have more grams of crude protein than the ones on the high-calorie side, and the protein quality scores are higher too. The nutrients have to fit into a finite amount of physical space, and I suspect that the higher-calorie foods have such a high fat content that it literally doesn't leave much room for protein. Roudybush reports that as the amount of fat increases, more protein must be added to maintain the correct ratio of protein per calories, saying "When the amount of carbohydrate nears zero and the amount of fat reaches 60%, protein needs to be increased to 30% of the diet to maintain adequacy." 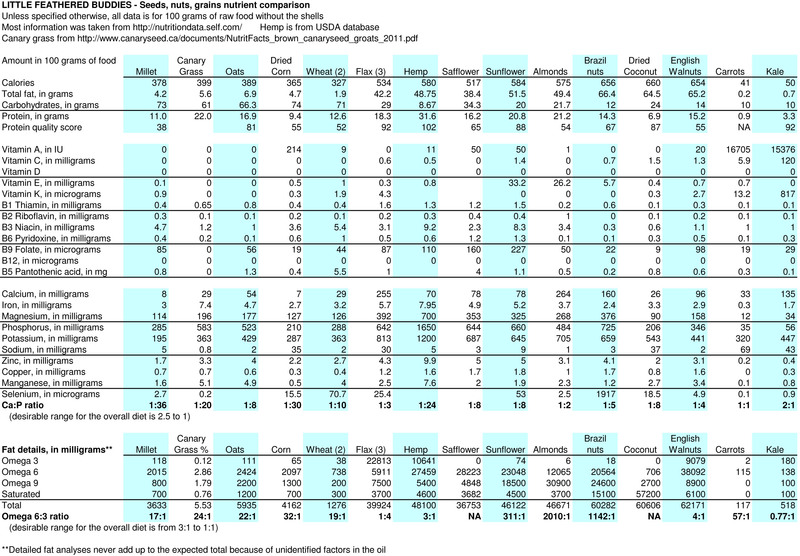 Six of the nuts in Table 2 (above) are more than 60% fat but none of them are more than 15% protein. Why do I think that hemp is clearly superior to sunflower? There's not much difference in the calories. But hemp has a lot more protein (32% vs 21%), and the quality score is a lot higher too (102 vs 88). I've calculated a complete-protein to calories ratio based on the Expert Panel recommendations for birds, and hemp is the best thing on the chart. It's difficult to get enough complete protein in a pet bird's diet without blowing the calorie budget, so when you're feeding high-calorie foods it's a huge plus if they deliver an adequate amount of protein along with it. A score of 100% or higher in Table 3 means that the seed/nut delivers an appropriate amount of protein for the calories. A score higher than 100% is desirable because it means that the protein level is superior, not just adequate. A score of less than 100% is undesirable because it means that protein intake is not keeping up with calorie intake, and additional complete protein will be needed somewhere else in the diet to make up for this deficit. Sunflower beats everything else on Vitamin E and is generally superior on the B vitamins too, but hemp has the second-best Vitamin B levels on the chart. Then finally there's the fatty acid content. Hemp has over 10,000 mg of Omega 3 fats versus 74 mg in sunflower. Hemp has the highest Omega 3 level on the chart, and the only other listing that even comes close is walnuts, which have an unusually low completeness score compared to the neighboring columns (26 for walnuts versus 36 for hazelnuts and 32 for brazil nuts). The apparent reason for this difference is that walnuts have about 5 grams more fat than hazelnuts, and the brazil nuts (which have almost exactly the same number of calories as walnuts) have significantly better protein quality. Even corn, which is often disparaged as a low-quality filler by walnut fans, has a significantly higher completeness score of 34. Sunflower seeds are clearly superior to everything on the chart that is higher in fat and calories than they are. But how do they compare to the nuts that have fewer calories (cashews, pistachios, and almonds)? NutritionData and I agree that sunflower is better than almonds. Their macronutrient levels (fat, carbohydrates, protein) are surprisingly similar and there's very little difference in their calorie count. But sunflower's protein quality and complete-protein to calories ratio is much higher, and that's the main deciding factor for me. Almonds have the highest calcium level on the chart by a wide margin, but be aware that most of the calcium in almonds is not actually bioavailable. Almonds are high in both oxalate and phytic acid, which inhibit calcium absorption, and it's estimated that the body can use only 16-21% of almond calcium (Scientific Curiosity, Health Kismet). See the Antinutrients article for more information on oxalate and phytic acid. In any case, there's no need to rely on a high-fat nut as a calcium source when mineral blocks, cuttlebone, and calcium grit are cheap, easy to find, very bioavailable, and calorie-free. The oxalate numbers for almonds are variable, ranging from roughly 200mg per 100g (Wake Health) to more than 500mg/100g (Savage). Sunflower seed averages only 37 mg of oxalate per 100g (Wake Health), so they beat almonds in this respect too. I'm more impressed with pistachios. 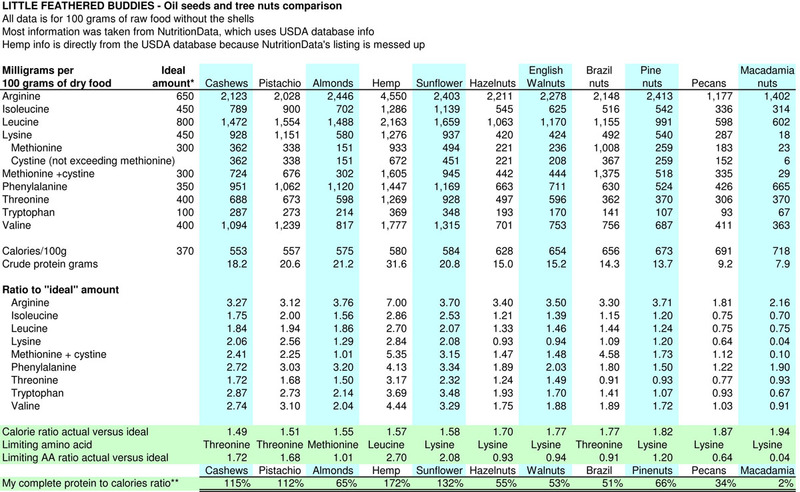 Pistachio has about the same amount of protein as sunflower but the quality is significantly higher (Table 2). Sunflower has the best Vitamin E level on the chart, but pistachios have 10 times as much Vitamin A as anything else. I guess the Vitamin A level is what happens when a nut is green instead of light tan. But it's easy to get Vitamin A from low-calorie vegetables, so the Vitamin A content of pistachios isn't a deciding factor. Sunflower outscores pistachio for Vitamin E, several B vitamins, and a few minerals. It's a tough choice, but I tend to prefer the sunflower because it has a better complete protein to calories ratio for birds than pistachio does, although pistachio's ratio is also very decent (Table 3). The amount of protein per calorie is more meaningful IMO than a quality score that does not take calories into account. On the other hand, the limiting amino acid for pistachio is threonine, which tends to be better supplied in the diet than lysine, which is the limiting AA for sunflower. So pistachio is more likely to add some complementary protein when combined with other foods. Cashews are the lowest-calorie nut on the list, and they're pretty respectable too. They have a decent amount of high-quality protein, and their complete protein to calories ratio is slightly higher than pistachios but not as high as sunflower. Don't forget that there are other foods that will provide the same nutrients with fewer calories, and that everything on the chart from the lowest to the highest is a high-fat food that needs to be offered with restraint if at all. But if you're going to offer high-calorie seeds and nuts, it's smart to pick out the ones that deliver the most for the calories. For me, the top three are hemp, sunflower and pistachios. Cashews come pretty close too but overall I like pistachio better. If you have a serious reason for preferring something else then go for that. It seems like almonds and walnuts have more or less achieved cult status in some parts of the bird community, which has seriously overestimated their actual nutritional value. But fitting in with the crowd isn't a valid reason for choosing those particular nuts over something that is more nutritious. Here are links to NutritionData's listings for the seeds and tree nuts if you want additional information: cashews, pistachio, almonds, sunflower, hazelnuts, walnuts, brazil nuts, pine nuts, pecans, macadamias. Remember to change all serving sizes to 100 grams for comparison purposes. Note: NutritionData has a listing for hemp seed, but it should not be used because it is seriously messed up. Their listings usually match the USDA database, but something went wrong with hemp. So Table 2 uses the USDA listing for hemp, which is expected to be more reliable. Other sources indicate that the USDA information on fatty acids is more accurate than NutritionData's (Callaway, Nutiva). Since NutritionData doesn't have an accurate listing for hemp seed, it means that we don't have an accurate completeness rating for it either. The highest completeness rating in Table 2 is sunflower's score of 49, and if they had an accurate score for hemp it would probably blow sunflower out of the water. We don't have an "official" protein quality score for hemp either, but the figures in the last 10 pages of this paper by House show that the protein quality of hemp nuts (dehulled hemp seed) is slightly higher than that of cashews for humans. NutritionData's protein quality score for cashews is 100, so I have assigned a score of 102 to hemp seed. The figures in the House paper also show that the nutritional value of hemp protein is significantly higher for laying hens than it is for humans, which is certainly relevant to birdkeepers. Now let's talk about those "healthy fats". There is nothing special about the fats in tree nuts - in general they contain the exact same fats found in all seeds and grains, but the nuts have a higher percentage of these fats without an overall increase in the vitamin/mineral content to make the extra calories worthwhile. The definition of a healthy fat within the bird community seems to have evolved to mean any kind of fat that comes from a plant and is "natural" enough to tickle the fancy of the alternative community. There doesn't seem to be any regard for whether it's something that the bird actually needs in its diet or not. Even saturated fat (which is still strongly suspected of causing heart disease) has been redefined as a healthy fat, as long as it comes from some kind of tropical plant. The healthy-fat talk mostly refers to tree nuts that provide too much Omega 6 and not enough Omega 3, and to Omega 9 and saturated fats that aren't needed in the diet at all. There is a misconception circulating in the bird community that many tree nuts are high in Omega 3, but the only items in Table 2 with a significant amount of Omega 3 are hemp and walnuts; everything else is very low in it. As mentioned earlier, flax seed, chia seed, perilla seed, and kiwi fruit seed are much higher in Omega 3 fats than anything in Table 2. Complete nutritional profiles are not available for perilla and kiwi, but NutritionData's profiles for flax seed and chia show that they also have a decent amount of good-to-high quality protein, and flax has a fairly high completeness score of 48. This is somewhat deceptive though, since their very high fiber level (about 30%) will interfere with their digestibility and make it hard to get at the nutrients. The Fats & Oils article has a section on improving the digestibility of Omega 3 seeds. There's also a lot of praise for processed oils (especially coconut) which strip away most of the nutrients in the original seed/nut and don't leave behind much of anything but the fat. See Table 4 for a demonstration of the nutritional difference between a whole seed/nut and the processed oil. The original seed/nut contains protein, carbohydrates, fiber, and an abundance of vitamins and minerals in addition to the fat. With the exception of red palm oil, oils provide a lot of fat and not much of anything else. RPO does provide a significant amount of Vitamin A, but veggies are a better choice since they provide plenty of Vitamin A with much less fat calories. Coconut is the one nut that really is different from the others. It contains a high level of unusual saturated fats that most birds would never eat in the wild, so it's a very unnatural food for them. See the Coconut Oil article for more information on why you shouldn't jump on the bandwagon for this fad. Omega 6 oils are being promoted too, even though Omega 6 is already oversupplied in the diet. The use of processed Omega 3 oils (primarily flaxseed oil) is reasonably justifiable, since it's difficult to get enough Omega 3. The best Omega 3 seeds are tiny and not always easy to incorporate in the diet. But it's hard to justify the use of the other processed oils, which primarily provide unnecessary fat. You're better off feeding the original seed or nut instead of the oil, because your bird will get less fat and more protein, vitamins and minerals that way. They will probably get more enjoyment from eating the actual seeds and nuts too. There's a rumor on the internet that feeding peanuts to birds causes aspergillosis. This is wrong. There really are some issues related to peanuts, but aspergillosis is not the problem. The real risk is aflatoxicosis, which is very different. But there's an easy way to minimize the risk. Peanuts sold for human consumption are expected to be as safe as any other food. It's the ones sold as animal feed that you need to watch out for, so avoid seed mixes that have peanuts in them and use other sensible precautions. Professionally formulated pellets that have peanuts as an ingredient are safe because they use human-quality peanuts. So what do all these long words starting with "A" words mean? Aspergillus is a genus covering several hundred different mold species. Molds are a sub-classification of fungi, so you'll often see Aspergillus called a fungus. Most of the Aspergillus molds don't cause any problems, but there are a few that do. Aspergillosis is a respiratory disease caused by the species called Aspergillus fumigatus. The spores from this mold are everywhere in the environment and we inhale them every day, but this doesn't cause problems in healthy individuals because the immune system can deal with the spores. But if the immune system has been weakened by something else, this mold can take advantage of the situation and grow in the body, attacking the lungs and possibly spreading into other organs. It's possible for A. fumigatus to be present in peanuts, but aspergillosis is caused by inhaling the spores not by eating it. It wouldn't be a good idea to crack open a moldy peanut and inhale the crud that's in it, but in general peanuts aren't considered to be a cause of aspergillosis. Mycotoxins are poisonous chemicals produced by fungi as part of their metabolism process, and aflatoxins are a specific type of mycotoxin. Moldpedia has a good general-information article on aflatoxin. Mycotoxin contamination can occur in any kind of agricultural crop, and presumably in wild plants too. But field corn and peanuts are more prone to contamination than other crops. Aflatoxicosis is the poisoning that results from eating aflatoxin. It primarily attacks the liver, and can cause severe illness and death in both humans and animals. The aspergillus species that's responsible for aflatoxin contamination in peanuts, tree nuts, and many other crops is Aspergillus flavus - a different mold species than the one that causes aspergillosis. Another species, A. parasiticus, can also cause aflatoxin contamination in food. Obviously, what has happened here is simple confusion. We have two different diseases, with long names starting with the letter "a", and both caused by some type of aspergillus mold. The bird community has mixed them up and is attributing the wrong problem to the wrong source. Aspergillosis and aflatoxicosis are serious health problems for humans too, but I can't find any source claiming that peanuts can lead to aspergillosis in humans. You definitely don't want to eat food that's contaminated with A. flavus. The best way to avoid it is by using only peanuts that were produced for human consumption. The quality standards for human foods are higher than those for animal feed, so the risks are minimal and peanuts sold for human consumption are expected to be safe. Don't eat nuts that are discolored or show any signs of mold. Peanuts with the shells removed have a lower risk than the ones that are still in the shell. If using peanuts that are still in the shell, avoid any that have damaged or discolored shells. Dry-roasted nuts may have a lower risk than raw nuts. Aflatoxin is heat-resistant, so cooking won't get rid of any aflatoxin that was there before the nut was roasted. But the heat will kill any mold or bacteria that's still in the nut, and prevent any more aflatoxin from forming. Mold can grow in poorly stored nuts, so keep them in airtight containers in cool, dry conditions to prevent any new problems from developing. It appears that apiaceous vegetables (carrots, parsnips, celery, parsley, cilantro) can reduce the damaging effect of aflatoxins (Peterson et al, Kang et al, Mohamed & Fagan), so including these vegetables in your bird's diet may be helpful. Wikipedia has a list of more apiaceous vegetables and herbs. Strangely enough it looks like brassica vegetables (broccoli, kale, brussels sprouts, cabbage, etc) may increase the effect of aflatoxin (Lampe et al). But these vegetables are beneficial in other ways, so feed them too. The primary reason that vets caution bird owners against peanuts is due to their calorie content, not the contamination risk. Peanuts are 49% fat, which is less than many of the tree nuts but still adds a considerable number of calories to the diet (NutritionData). The quantity and quality of peanut protein is better than most tree nuts too, but with all high-fat foods it's easy to overdo the calories. If peanuts are used, they need to be fed in moderation.